No matter what their door-to-door salesmen tell you, their “fiber” turns out to be regular wireless internet. Wireless is simply not as good as fiber—never has been, never will be. Don’t be fooled! Direct Communications is the ONLY Fiber Optic Network in Eagle Mountain. Choose real fiber service from Directcom—the fastest, most reliable connection in Eagle Mountain. Data Caps None Yes–be prepared to be throttled or charged if you go over your cap. We should definitely make a special mention of latency or ping times here. Light over fiber travels at…well, the speed of light, and connects directly back to the national Fiber Internet backbone, with no medium changes between you and the cloud. This results in the fastest ping times of any service. Wireless networks have very slow ping times because the signal is bouncing back and forth over the air between neighbors, hub homes and wireless antennas all the way across the valley back to the main office, and only after multiple handoffs does it hit a fiber line. All that switching takes time, so if you are a gamer and server reaction times are important to you, wireless is not your best option. Why will you have a better streaming video experience with Directcom than with any wireless ISP in Eagle Mountain? We don’t put a cap on how much you are allowed to download or watch each month. Our network is state-of-the-art fiber optic cable, specifically designed to stream high-definition video. We offer unmatched speeds up to 1 Gig (1000 Mbps). We are the only wired network in town. Wireless internet equipment simply wasn’t built to handle constant high-demand applications like high-definition video very well. Unlike wireless providers, your bandwidth is not shared with your neighbors, so you can all stream video at the same time and not be affected by your neighbors’ usage. We are a Netflix SuperHD partner, and Netflix has co-located within our Network to bring you faster access, quicker browsing, and higher resolution video. With us, you can watch multiple HD streams at the same time on different devices in your home without ever running out of bandwidth. 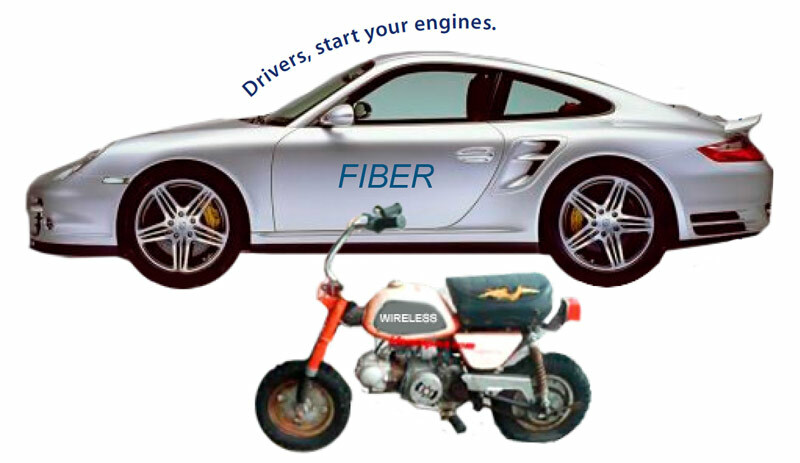 Fiber versus wireless – it’s not even a fair fight. Kyle Sorensen – “Digging a hole with your hands when you have a backhoe. Tj Hitz -“Driving home in rush-hour traffic instead of riding the front runner train!